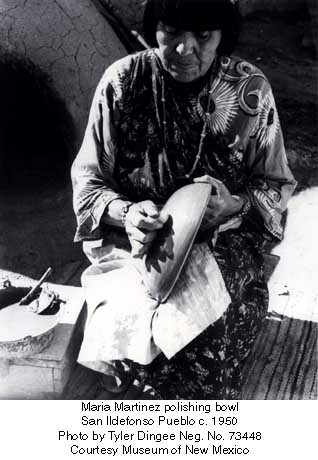 Undoubtedly the world's most famous Native American potter, Maria Montoya Martinez was born in the Tewa pueblo of San Ildefonso around 1887. As she grew up, Maria observed her aunt, Nicolasa, and learned the basics of the traditional art of pottery making from her. 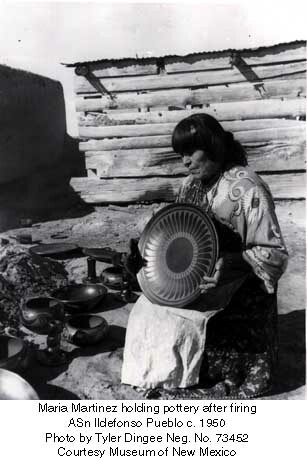 In the early years of her career, Maria produced the traditional polychrome pottery of her village, generally black and terra cotta decorations painted on a background of white or tan. 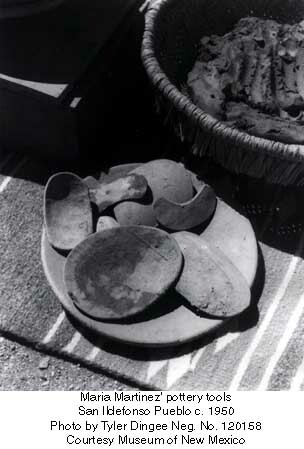 She shaped her pots the age-old way, by carefully hand-coiling and pinching the clay, then smoothing the inner and outer surfaces with gourd scrapers. 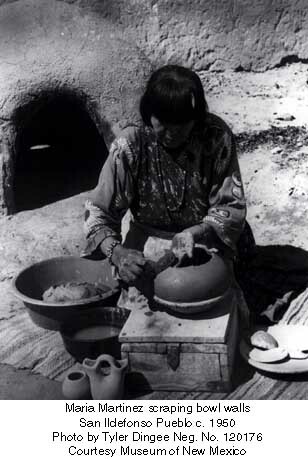 Early on her pots were recognized as the thinnest, most beautifully shaped pots being made at San Ildefonso. Her husband, Julian, an accomplished painter of hides, paper and walls, decorated the pots for her, then worked with her in the firing of them. Maria and Julian were married in 1904 and almost from the beginning of their marriage they were traveling to demonstrate their craft at various fairs and expositions. They spent their honeymoon in 1904 demonstrating pottery making at the Louisiana Purchase Exhibition at the St. Louis Worlds Fair. They demonstrated their craft again at the Panama California Expo in San Diego in 1915, the Chicago Worlds Fair in 1934, and the Golden Gate International Expo in 1939. 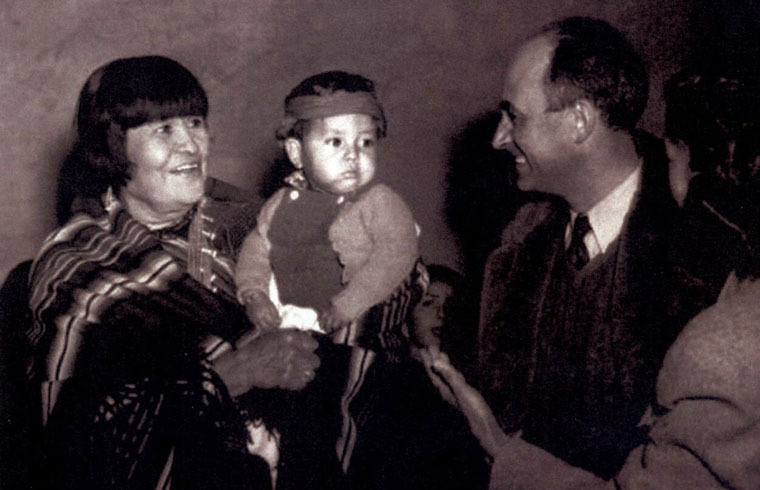 Native American craft fairs provided other marketing opportunities, and by signing her work Maria both heightened her visibility and commanded higher prices. In 1954, she won the Craftsmanship Medal from the American Institute of Architects, the national institute's highest honor. 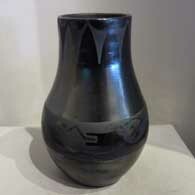 Contrary to legend implying that Maria "discovered" the black pottery process, Dr. Edgar Lee Hewett, Professor of Archaeology at the University of New Mexico in Albuquerque and Director of the Museum of New Mexico in Santa Fe, found shards of prehistoric black-on-black pottery while excavating in the ruins at Bandelier National Monument in 1908. 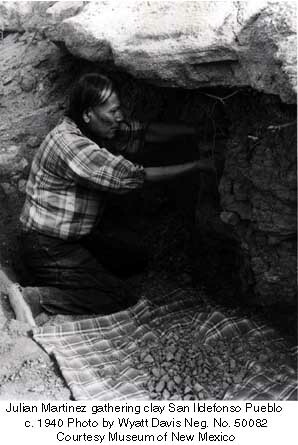 To preserve and showcase that ancient product Hewett sought a skilled pueblo potter who could re-create that ancient pottery style for him. Everyone he asked referred him to Maria. 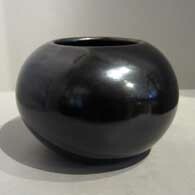 Together they worked out a deal and he pre-ordered a series of black-on-black pots from her. 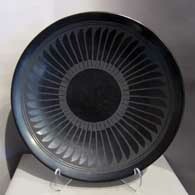 That led to more than a decade of experimentation, until Maria and Julian were satisfied with their results in recreating that style of black ware. 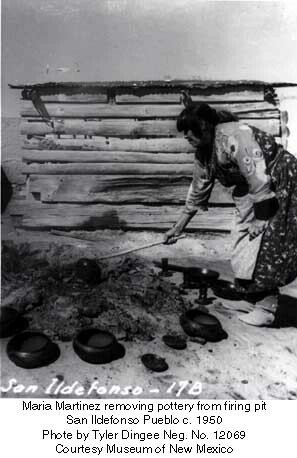 Their method required smothering the fire with manure during the firing process, effectively creating an "oxygen-reduction process" that turned the red pots black. 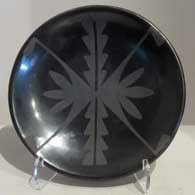 Julian worked out the other half of the "black-on-black" process when he began painting his designs "in the negative," using a matte black slip on the polished pot surface to create his decorations. Once fired, that demonstrated the technique that has become so famous today. Still, Maria wasn't really happy with those first black-on-black pots until Hewett came to visit with some friends and students of his. 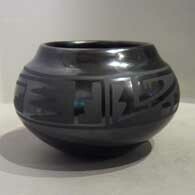 Those visitors bought virtually every pot Maria had on hand and they encouraged her to make more. 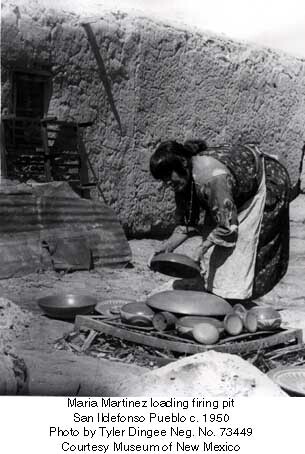 Maria responded by refining her process and technique with the clay and the fire. Julian responded by refining his designs and decorations. 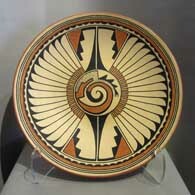 Together they elevated their art to a level not approached by any other pueblo potter for at least 10 years.